^ 1.0 1.1 Gamers Catch Their Breath as Xbox 360 and Xbox Live Reinvent Next-Generation Gaming. Microsoft. 2006-05-10 [2009-03-30]. （原始内容存档于2008-06-21）. ^ 2.0 2.1 E3 2014: $399 Xbox One Out Now, Xbox 360 Sales Rise to 84 million. GameSpot （英语）. ^ EXCLUSIVE: Xbox One Confirmed as Name of Microsoft's New Console. [2013-05-07]. （原始内容存档于2013-05-10）. ^ Microsoft Confirms Next-Gen Xbox Announcement. IGN. 2013-04-24 [2013-04-24]. ^ Cellan-Jones, Rory. Global launch for Microsoft Xbox One console. BBC. ^ Xbox One ignites a new era of games and entertainment this November. Microsoft. 2013-06-10 [2013-06-10]. （原始内容存档于2013-06-13）. ^ Gilbert, Ben. Getting to know Microsoft's new Xbox lead, Phil Spencer. Engadget. 2014-04-10 [2014-05-09]. ^ Satya Nadella email to employees on tuning our organization. Microsoft. 2014-03-31 [2014-04-06]. （原始内容存档于2014-04-05）. 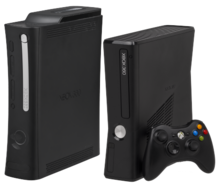 ^ Xbox 360 release date confirmed - The INQUIRER. 2007-10-19 [2018-09-22]. ^ 10.0 10.1 Xbox One to Launch on November 22, 2013 in 13 Markets | Xbox Live's Major Nelson. majornelson.com. [2018-09-17] （美国英语）. ^ Xbox One 確定 9 月 4 日在日本推出 共 48 家當地廠商加入. 巴哈姆特電玩資訊站. [2018-09-18]. ^ 微软Xbox One汉化游戏机定于29日在中国内地发售-搜狐新闻. news.sohu.com. [2018-09-18]. ^ Asher Moses. Prepare for all-out war. The Sydney Morning Herald. 2007-08-30 [2007-11-24]. ^ Morris, Chris. Grand Theft Auto, Halo 3 headed to Xbox 360. CNN. 2006-05-09 [2007-11-24]. ^ Epstein, Zach. MICROSOFT SAYS XBOX 360 SALES HAVE SURPASSED 76 MILLION UNITS, KINECT SALES TOP 24 MILLION. BGR.com. 2013-02-12 [2013-02-15]. ^ Cunningham, Andrew. Xbox One gets a CPU speed boost to go with its faster GPU. ArsTechnica. 2013-09-03 [2013-11-26]. ^ Xbox 360 DivX/XviD Playback Tested (Verdict: It's Almost Perfect). 2007-12-04 [2008-06-24]. ^ Xbox 360 Media Download Center. Xbox (Microsoft). [2007-10-30]. （原始内容存档于2007-10-29）. ^ XNA Game Studio Express. MSDN (Microsoft). [2007-10-30].